In 1944, Grandpa, my father’s father, stepped onto the battlefields of Europe in the final weeks of World War II. His division, the 89th, pushed deep into Germany. He was one of the soldiers who stumbled, shocked, into Ohrdruf, the first concentration camp to be liberated. In 1962, Medzbaba, my mother’s father, arrived in the United States in the final wave of the Armenian diaspora. It was nearly half a century since his Armenian family was chased from their ancestral homes by the Turks in the first genocide of the twentieth century. Medzbaba happily became an American citizen. 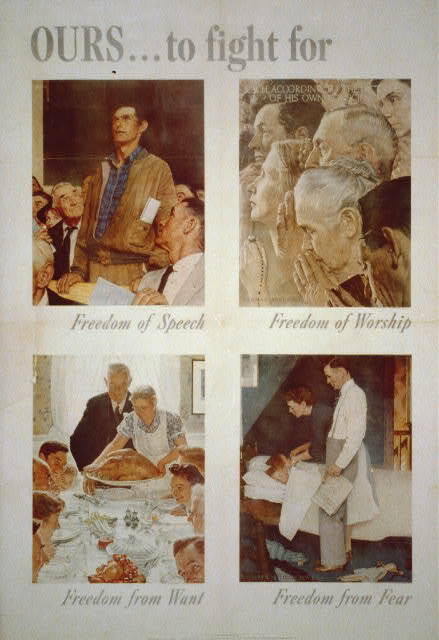 In his living room were proudly displayed Norman Rockwell plates depicting the four freedoms that my paternal grandfather, along with others of the Greatest Generation, fought for in the second world war. Everywhere in the world, he said, including America. Too many Americans currently do not celebrate freedom from want. Within the United States, there is no economic understanding to guarantee Americans access to the medical care needed to support healthy living. Too many Americans are uninsured, and the numbers of uninsured are rising, to 1 in 6 in the 2010 census, or 50.7 million Americans. Job losses and skyrocketing medical costs led to this want of health care security. And job losses have hit African American and other minority communities especially hard, with a staggering 16% unemployment rate, versus the 10% national rate. In 2011, we have the opportunity to rise together to support reforms to our health care system that may ensure a healthier, more peaceful America. The Affordable Care Act ensures freedom from the fear of loss of insurance with the loss of a job. Freedom from discrimination against women who become pregnant. Freedom for young adults covered by their parents’ insurance until they’re 26 to pursue their life paths based on passions rather than access to health insurance. The Affordable Care Act represents an important step toward creating a nation that ensures healthy peacetime lives for its inhabitants. It’s what Grandpa fought for in World War II and what Medzbaba immigrated across the Atlantic to reach.